the process of injecting liquid at high pressure into subterranean rocks, boreholes, etc. so as to force open existing fissures and extract oil or gas. Since the industrial revolution, our energy consumption has increased relentlessly. Most of this energy is supplied by fossil fuels like coal or natural gas. Recently there’s been talk of another, more controversial method: fracking, a term short for hydraulic fracturing. Simply put, fracking describes the recovery and removal of hydrocarbons locked deep within the earth. Drilling rigs are constructed for the purposes of extracting natural gases such as butane, methane and propane. These gases are usually found deep underground in beds of shale, formed from the floors of ancient oceans. Once a drill site has been established and an infrastructure rig assembled the process of drilling begins. The drill starts by boring into the ground, down to the shale bed. 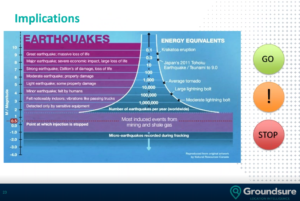 Depth varies but the average has been suggested as 7, 700 feet or 2.3km. When the desired depth has been achieved the drill takes a 90-degree turn and continues to drill horizontally; parallel to the target rock area. This horizontal drill can also travel for thousands of feet. When the well has been drilled a layer of cement is then pumped down the entire length of the hole, creating a casing designed to protect the groundwater supply from becoming contaminated. Once drilling and cementing has been completed a perforating device is inserted. When the device reaches the far end of the well it explodes, creating holes in the casing and rock. The perforating step is repeated several times until the horizontal stretch of the well contains a series of small cracks. 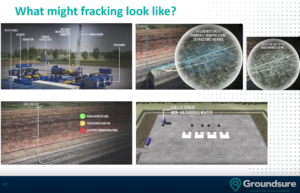 A ‘fracking solution’ consisting of water, sand and chemicals is then pumped under immense pressure into the well, expanding the holes and creating fractures in the porous rock. The chemical solution acts as a lubricant whilst killing bacteria and preventing mineral build up in the pipes. The solution is then pumped back out leaving tiny fractures, some only tenths of an inch, which are kept open by the grains of sand. The process frees the hydrocarbons which then travel back up with the solution. Although the technique has been known since the 1940s it has recently made a resurgence as the supply of natural gas and oil is rapidly depleting. This need for more energy sources has led way to a fracking boom, especially in the US. Roughly .5-1% of the ‘fracking solution’ is made up of chemicals, including benzene and methanol. These substances are highly toxic and corrosive and known to be harmful to humans. An estimated 7,000,000 gallons of water (31,000 tons) is used to frack just one well, equating to roughly 310 tonnes of chemicals per well. Fracking, when done correctly, should not contaminate drinking water aquifers. However, subterranean systems are mysterious and it’s impossible to tell how interconnected the shale deposits might be with ground water. As 30% (93 tonnes) of the solution remains trapped underground after the wells have been fracked, many worry that groundwater and the newly injected fracking solution may mix, causing chemicals to leach into the water supply. It is difficult to establish the exact number of cases pertaining to contamination from fracking. Improperly installed or maintained fracking wells are at risk of becoming integrated with the drinking water. There are incidents of energy companies in the US receiving fines for contaminating drinking water via incorrectly bored and sealed wells. There are two arguments regarding the link between fracking and water contamination. Some believe that fracking does pose a harm to the potable water supply, whilst others deny this accusation. One of the main chemicals used in the fracking process is methane. It is estimated that 4% escapes into the atmosphere during extraction. Because methane is 25 times stronger than carbon dioxide in terms of trapping heat, the release of this gas is detrimental to the air quality of surrounding fracking sites. Additionally, the ancillary components of fracking directly increase air pollution at well sites. These include the pollutants released from new construction and subsequent operation of fracking locations, the increased emissions from transporting oil and gas from the site, in addition to waste disposal and storage. Pollutants increase the production and long-term lingering of smog, which decreases the availability of clean air for workers and local residents. Waste water is also an issue at fracking sites. Between 20% and 40% of the water used for fracking that is returned to the ground surface consists of toxic contaminants. The presence of wastewater has harmful ramifications on the environment, as it cannot be easily treated and returned to the usable water for purposes other than fracking. Even though fracking has the potential to provide more oil and gas resources to consumers, the process of extraction has long-lasting negative impacts on the surrounding environment. 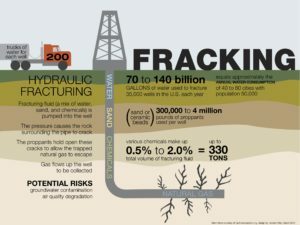 Air pollution and water contamination due to the toxic chemicals used in hydraulic fracturing are the greatest concerns within fracking sites, while the need for wastewater disposal and drinking water supplies are also pressing issues directly related to fracking. Why Would I Need an Energy Report? 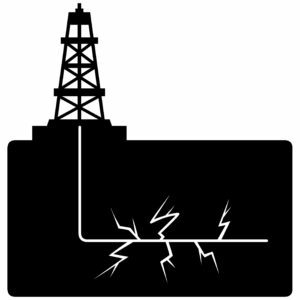 With an estimated 2.5 million wells fracked worldwide, it pays to be in the know about upcoming energy proposals. Fracking has been used by UK North Sea’s oil and gas fields since the 1970s. 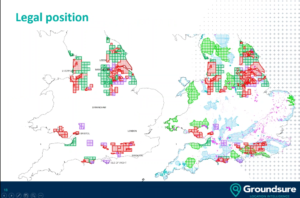 Although around 200 British onshore conventional oil and gas wells have been drilled since the early 1980s, the process is still fairly new to mainland UK. Fracking has revolutionised the US’s oil and gas industries. Since 2005 80,000 wells have been created. The industry now accounts for 40% domestic gas and 30% of oil production. Identify possible impacts on the enjoyment of the property, potential loss of value. Locate liability for solicitors/due diligence. 11% of the UK either licensed or offered for hydro carbon exploration development. 20-40 new sites planned for development over next two years. 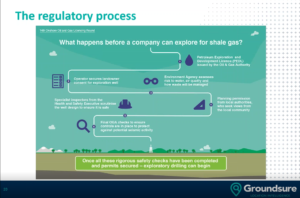 Fortunately, the UK has more stringent rules than when it comes to fracking, however, changes to the 2015 infrastructure act, namely change in ‘trespasser rule’ mean that an operator no longer needs the land owners permission if they drill 300m below the surface. Left: Red, dark green and purple blocks: licensed areas for on shore hydrocarbon exploration and extraction. 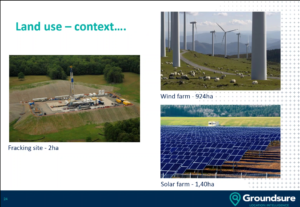 Green blocks depict conventional oil and gas. 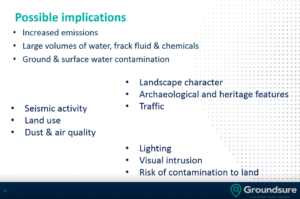 Road traffic dramatically increases with the presence of a fracking site as lorries are required to carry water to the site and remove waste water. 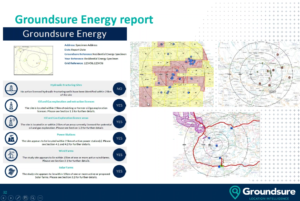 Groundsure estimate between 1.200-4,800 tanker journeys required per well. 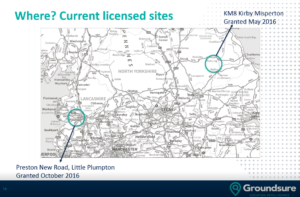 This entry was posted in environment, Property Market and tagged Contaminated land, Conveyancing, Energy, Groundsure, Pali. Bookmark the permalink.